Spatial Insights' Spatial Disaggregator is a MapBasic application that enables data from coarse levels of geographic resolution, such as county, to be disaggregated, or apportioned, to areas that have finer geographic resolution, such as block groups. 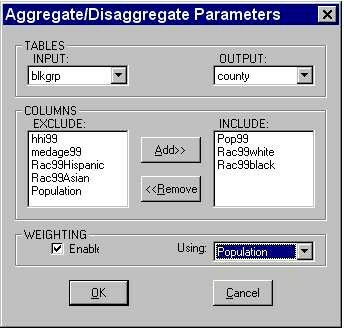 Similarly, the Disaggregater enables data from finer levels of resolution, such as block group level demographics, to be aggregated, or recombined, to lower levels of geographic resolution, such as county or ZIP Code. Geographic information used in mapping applications is often only available at certain levels of geographic resolution. The process of aggregating or disaggregating variables from one level to another is required prior to evaluating correlations in support of trade area analysis and demographic profiling applications. Traditionally, this is a difficult and time consuming process. Spatial Insight's Disaggregator application was developed in response to customer driven project requirements. The Disaggregator is a MapBasic application, which runs entirely within MapInfo. It enables data from coarse levels of geographic resolution, such as county, to be disaggregated, or apportioned, to areas that have finer geographic resolution, such as block groups. Similarly, the Disaggregator enables data from finer levels of resolution, such as block group level demographics, to be aggregated, or recombined, to lower levels of geographic resolution, such as county or ZIP Code. Spatial Insights' Disaggregator was designed for MapInfo professionals involved with database development, market research, trade area analysis, and demographic profiling studies.